Community hospitals play an important role in American’s everyday life. They are anchors, often holding towns, cities and communities together in times of challenge and adversity. They are safe havens for patients during medical emergencies. They are beacons of health and hope for families in the throes of some of the most trying and confusing moments of their lives. They are also great places to build long, fulfilling and rewarding careers. According to the American Hospital Association, there are thousands of community hospitals across the country–and not all of them are located in rural areas and small towns. You can find them in suburban areas and even larger cities. Each year, America’s community hospitals serve millions of people from all walks of life and employ thousands of physicians. While some physicians prefer large teaching or research organizations, others have made the decision to build their careers at community hospitals–and enjoyed long-term success. Large hospitals typically deal with a greater number of patients, but unless you are a hospitalist, how many will you actually get to treat? At a community hospital, there is a greater likelihood of you getting to treat patients from the moment they present to the time they are discharged or the medical condition is addressed. In addition, you will be less likely to have your position as the primary physician usurped by a specialist. And, if you are a specialist, say a surgeon, you will probably get to do more in the surgical suite–conduct C-sections, set screws in hips and perform a below-knee amputation, for example. It might seem counter-intuitive, but many physicians find they actually have more opportunities to gain valuable experience at a community hospital. In a healthcare world that’s largely driven by quotas, time with patients is at a premium. However, many physicians find that they get to build stronger connections with patients at a community hospital because they are smaller and they often have a lower census. Building meaningful connections with patients can increase job satisfaction, improve outcomes and make a tangible difference your professional life and the personal lives of your patients. Physicians and administrators sometimes don’t see eye-to-eye. After all, physicians are trained to be individualists and make important decisions while on the front lines of patient care. These traits–combined with the bureaucracy of large, complex organizations–tend to create tension. Over time, the tension can create an atmosphere in which it is no longer fulfilling to practice. You are simply less likely to run into these types of issues at community hospitals. They’re smaller, have less bureaucracy and often have physicians or former physicians in key leadership positions. They tend to make supporting their physicians part of their missions. Over the course of a long career, this can make all the difference in the world. Work-life balance is hard for doctors to achieve, but it’s often easier when you work at a community hospital. Commute times tend to be shorter, the cost of living is lower and there are many opportunities to get away from it all that are located closer. The lower stress that comes with working at a community hospital tends to lead to longer, more fulfilling careers. Cities that rely on community hospitals look to physicians for more than just healthcare. They look for civic leadership, philanthropy and ideas about arts and culture. Yes, at a community hospital, you can join the ranks of the thousands of physicians who have enjoyed long, rewarding careers while playing important roles in their communities. Would you like to join a strong community hospital? 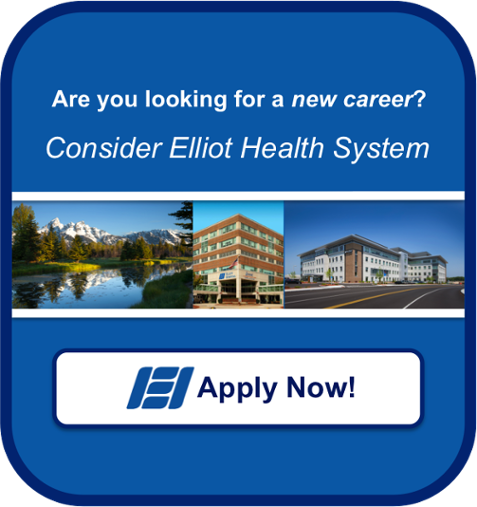 Consider a career with Elliot Health System.